"If Spain wants it, we could help in diverse ways, for example by simply auditing and monitoring reforms negotiated with its European partners without the IMF participating in financing," Lagarde told French daily Le Figaro. "But we could also play a role in financing," she added. I frequently translate articles from Spanish, German, Italian and other languages. However, the biggest syntactical changes occur in seldom-offered elsewhere, yet, badly-needed English-to-English translations. As a public service announcement, the Mish translation of the above statements by Lagarde is the same as the title of this post "IMF Ready to Plunder Spain". Mentally cross out "Ireland" and write in "Spain". The IMF was not out to "help" Ireland. 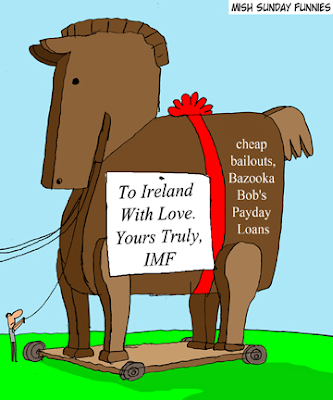 Rather the IMF was out to plunder Ireland for the benefit of banks in the UK, Germany, and France. The same Trojan Horse setup applies today.